Vichada benefits from the fact that it has the perfect geographic location and climatic conditions for cashew tree cultivation. Add to that the fact that cashew trees (Anacardium occidentale) are native to the region, and it becomes obvious that this high value tree offers a multitude of opportunities to tree buyers, as well as to local people in their socio-economic development. There are on average between 60 to 63 trees in a half hectare (2.47 acres), with a spacing of around 9 X 9 meters, depending on the variety. The trees we plant are the dwarf variety, so they rarely exceed 4 meters in height, making it easy to harvest the fruits and nuts in the future. 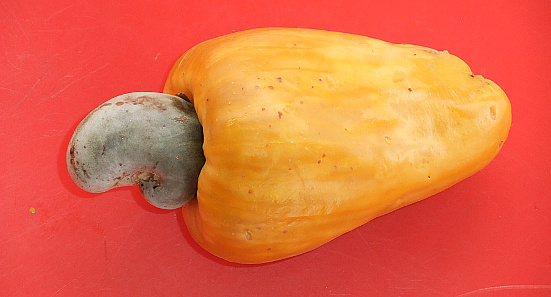 We use a terminology that is distinct when talking about the cashew tree: the shell is the hard outer layer that contains the kernel, better known as the cashew nut. The nut shell is attached to the false fruit. The false fruit is the size of an apple and twice as rich in Vitamin C than an orange. Harvest takes place in February and March, after which the nut shell is dried in the sun for 2 days, making it possible to store the shells for up to a year while processing them to extract and toast the nut kernels. The fruits are either eaten fresh or dried for cattle feed or human snacks. The fresh fruits can also be used to make wine and liquor, or cough syrups and other extracts. We only use natural fertilizers. How does the Cashew Tree program work? Since cashews are fruit trees, there is considerably more maintenance and care involved, which starts with the grafting process in the tree nursery. Given the difficulty of the task, we only sell cashew trees in lots of 60, which is the number needed to plant half a hectare of land. The trees sell for $25 USD each, for a minimum purchase of $1,500 USD for 60 trees. The trees will start to provide a return in their 5th year, which means that we are in a position to buy the trees back from the tree purchaser for $50 per tree in 8 years' time, or double the amount for which they were originally purchased. We will provide a Cashew Tree Joint Venture Purchase Agreement to interested cahsew tree buyers, and once the purchase is completed we will provide the cashew tree purchaser with a digital Cashew Tree Ownership Certificate. Your cashew tree purchase has other benefits as well: we cultivate the trees with small landholders or campesinos, which enables them to develop their farms, and the fruits and nuts are processed by local women belonging to MUVEA, a women's foundation dedicated to improving the lives of women and children and to sustainable rural development in Vichada, Colombia. The shells around the nut kernels can be pressed and produce a valuable oil used in the automative industry. The cashew tree itself has a productive life of about 35 to 40 yeats, after which it needs replacing. The hardwood lumber of the cashew tree has a market. The fruits can be used in pop drinks, while broken nut kernels can be used to make vegetarian hamburgers. Instead of exporting the nuts in their shells, local cashew tree producers, working with AGAF, the local agroforestry association, with MUVEA, the local women's foundation, and with CEO, the Center for Orinoco Studies at the Universidad de los Andes, are determined to establish a modern transformation or processing center for cashew products in Vichada.